Although all manufacturing operations require cleaning as part of their process, it is important to understand the distinct difference between “cleaning” and “precision cleaning.” For some industries, a surface that is visually clean may be sufficient while for others, even the most microscopic contaminants need to be removed to ensure the safety and quality of the equipment. Precision cleaning is the process that is utilized to achieve these critical levels of cleanliness in a wide array of industries, including Space, Aviation, Military & Defense, Medical Device, Semiconductor, Laser and Automotive. As such, we test and certify all materials prior to the cleaning process. Our cleaning methodologies are comprised of two core elements. The first element involves cleaning the surface using specific precision cleaning techniques combined with an approved cleaner in a process that has been validated for the stated purpose. The second element involves testing and verification that the surface is cleaned to the level of precision necessary for it to be safely used in its intended environment. Our degreed scientists test the critical surfaces for residues using a process called Gravimetric Non-Volatile Residue Mass Determination (NVR) Testing. We also quantify and size any remaining particles that are found on the critical surfaces. Aqueous Cleaning: This method allows parts to have a long dwell time in the cleaning solution. Additives such as detergents and surfactants are added to water that has been treated by deionization or reverse osmosis. This water-based cleaning method is very effective at removing different soils on parts that are compatible with water. The result is in an environmentally friendly method for achieving the desired level of cleanliness. Solvent Cleaning: Cleaning by immersion in solvents is particularly effective on parts with complex configurations and for certain soil compositions. This method utilizes the chemical properties of the solvent to remove the contaminants from the part. For some applications, solvent cleaning is used in conjunction with ultrasonic cleaning. Ultrasonic Cleaning: This technique uses cavitation which is induced by high frequency sound waves to agitate the cleaning solution aiding in dislodging particles. It is particularly effective for precision parts cleaning of complex parts with threads, rough surfaces and blind interior spots that are inaccessible by other cleaning methods. Ultrasonic cleaning typically employs aqueous, semi-aqueous and solvent-based cleaning systems and detergents. This combination removes contaminants at nearly a microscopic level, with higher sound frequencies generally able to remove finer particles. High-Pressure Spray Cleaning: This procedure utilizes the kinetic energy of a water jet to “blast” the particles and soils from a surface. It is most often used in conjunction with detergents or surfactants to chemically loosen or solubilize the soils in order for the water jet to more effectively remove the contaminants from the surface. The ability to vary the water pressure, nozzle size and/or spray pattern allows this method to be easily customizable for different materials of construction and soil compositions. Wipe Cleaning: This method uses special lint- and particle-free wipes or swabs, often wetted with solvents or deionized water, to hand clean delicate surfaces that cannot withstand more aggressive cleaning methods. Flush Cleaning: Using a turbulent velocity, cleaning liquids are flooded through the interior of tubes, pipes, and other internal pathways to flush the contaminants out of the hardware or component as it rotates. This method is particularly useful for precision cleaning of components of varying shape and size for which high-pressure sprays are not useful. Vacuum Bakeout: This methodology uses vacuum baking to volatilize hydrocarbon contaminants and remove hydrocarbons that are entrapped in the pores of sensitive equipment. It also reduces the outgassing rates to acceptable levels for aerospace instrumentation. 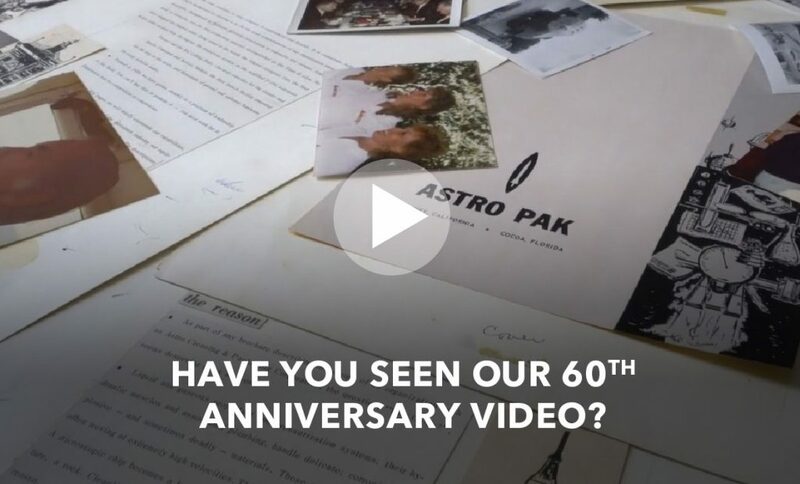 With nearly 60 years of experience in the industry, Astro Pak offers quality cleaning services to meet the requirements for hundreds of industry specifications, including those of aerospace contractors, ULA, NASA, the Department of Defense, and many private organizations. Our scientists and experts provide guidance and consultation on precision cleaning to some of the world’s most prestigious institutions. These include JPL, Lawrence Livermore National Laboratory, MIT, Cal-Tech and others. Our Research & Development professionals can develop a customized precision cleaning process that meets nearly any requirement. Astro Pak is home to the largest and most advanced contract precision cleaning facilities in the United States. Our southern California facility houses ISO 9001:2015 & AS 9100D certified ISO Class 5 & 6 (FED STD Class 100 & 1,000) cleanrooms and labs. The highlight of this facility is the 21,222 cubic ft Large Component cleanroom featuring a 26’W x 15’H high-speed roll up door, 18ft ceilings and a two-ton overhead bridge crane to accommodate hardware that is too large for most traditional cleanrooms. Now open, Astro Pak’s new Florida facility resides just outside of the Kennedy Space Center. This newly renovated 38,000 square foot facility features a 15’x15’ enclosed tower (70’ vertical) which enables the processing of hoses up to 60’ in length. Adjacent to ISO 7 & 6 (FED STD Class 1,000 & 10,000) cleanrooms and labs is a shop area with a four-ton bridge crane and expanded hydrostatic, hydraulic and pneumatic testing capabilities. In addition to Astro Pak’s in-house capabilities, we can also mobilize our state-of-the-art equipment and highly trained personnel on-site to your facility to perform preoperational or maintenance precision cleaning services and passivation services on your systems and equipment. Over 100+ industry, government, and individual company specifications!